An apt title for this post, but also for the software in question. Yet Another APRS Client (YAAC from now on) is a new program written by Andrew, KA2DDO that has recently entered beta test status. I stumbled across it a few days ago and am now running it on my G4ILO-2 VHF iGate. YAAC is written in Java so it runs equally well on Windows, Mac and Linux platforms as long as you have a recent Java runtime installed. YAAC is open source software and uses open source mapping (Open Street Map - OSM). APRSISCE does too, but whereas it uses bitmap tiles, YAAC uses vector-based map data. This makes the maps look a bit different (more as if they were drawn by a spider.) 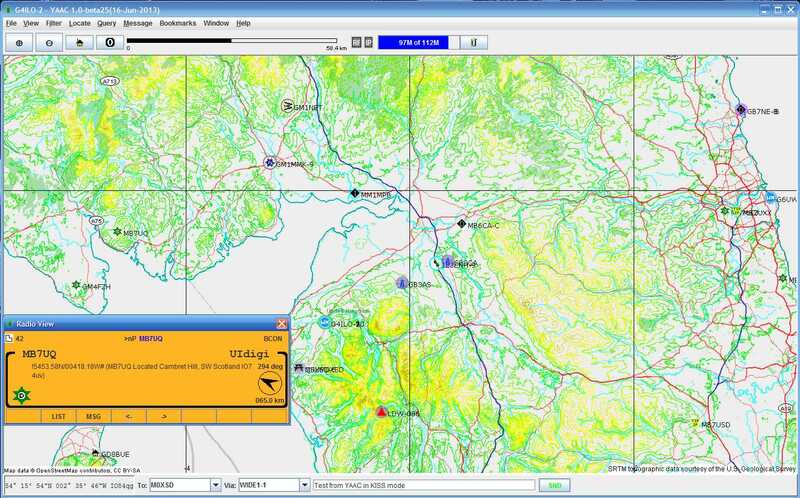 You can easily add topographical data from the US Geological Survey (the screenshot above shows this.) YAAC also supports the use of scanned-in maps but I haven't tried this. YAAC is very easy to use. There is a wizard to help you set up the program, though there is also an expert mode that allows you to get to all the settings directly. There are far fewer things that can be changed than APRSIS32 has which is one reason it is easier to use, but YAAC's user interface is more standard. 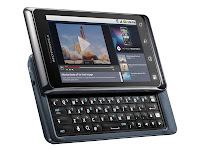 A File menu is on the left of the menu bar, Help on the right, and all the configuration settings are on a multi-tabbed dialog box not nested in three levels of menus. YAAC would be an ideal program for someone new to APRS, which is not to belittle the program in any way as it does all the things that most users would be perfectly happy with. YAAC supports a wide range of TNCs including TNC2 compatibles and the Kenwood mobiles. In APRS mode the Kenwood D700/D710 can only be used receive-only. In Packet mode the Kenwood can be used as a KISS TNC. Believe it or not I hadn't realized it had this capability until Andrew pointed it out to me. Just two commands (KISS ON, RESTART) are needed to put the Kenwood into KISS mode. The other thing that confounded me for quite a while is that the Kenwood TNC expects hardware flow control. Once that setting had been made everything started to run perfectly. One disadvantage of using the Kenwood D700/D710 in Packet mode is that the rig's display doesn't show any APRS information.However, Andrew has implemented a rather neat "radio view" which emulates the Kenwood display. The only extra thing that would make the emulation complete would be to limit it to only those packets received over the radio. With an APRS feed covering a wide area the display changes too quickly to be readable. 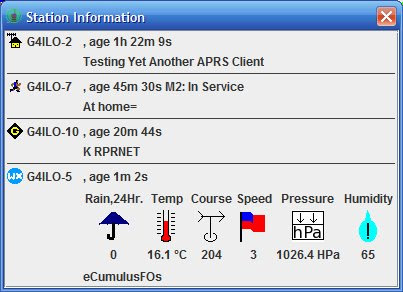 YAAC doesn't provide as much information about APRS objects as APRSISCE does.The window on the right is what you get when you click on one of the G4ILO icons. When two or more stations are co-located the calls overwrite one another making them unreadable. APRSISCE manages to position the calls so they don't overlap at all. Because YAAC uses vector graphics it does a better job of displaying APRS icons and even orients the icons of moving objects in the direction of motion. Zoom in to street level and you'll discover that icons are provided for points of interest. I was quite impressed when I saw what was displayed for our small town of Cockermouth. I think these objects come from OSM data. You might get the impression that I really like this new APRS client. It appears to be well designed, well written and is well supported by Andrew, its developer. It's a very impressive piece of software. I originally intended just to try it out for a couple of days but I think I'll stick with it for the time being. Good news for APRS enthusiasts with Android devices. Lynn Deffenbaugh, KJ4ERJ, is embarking on a port of his popular and successful APRSISCE to the Android platform, called APRSISDR. I use the words "embarking on" advisedly. Although there is a Yahoo group and a collection of testers (including yours truly) the software is in an embryo stage at the moment. You can see the beginnings of an APRS client starting to form but Lynn is really just testing the Android platform at the moment to see how various key things can be accomplished. I would hazard a guess that it will take several months before something usable appears, though those who were in at the start of APRSISCE development will recall that it advanced in leaps and bounds. It's going to be a fun ride, but for most I think it will be best to wait patiently for more news to emerge. Watch this space! I've been spending a few hours playing around with a FUNcube Dongle Pro. There was a lot of excitement about this project a couple of years ago when it started. In order to get one you had to be quick off the mark on Ebay. I never succeeded, then I got ill and then I forgot about it. This one was passed on to me by a friend who successfully purchased one but never used it. I started off by following the instructions in the user manual. I followed this by installing and setting up a complicated-looking SDR program called Spectravue. I was baffled by most of this program's settings and I wasn't sure if it worked. What I should have done was try some of the SDR programs I installed when I was playing about with USB TV dongles at the beginning of the year. I started SDR#, selected the FUNcube Dongle from a pull-down list, clicked Start and it just worked! 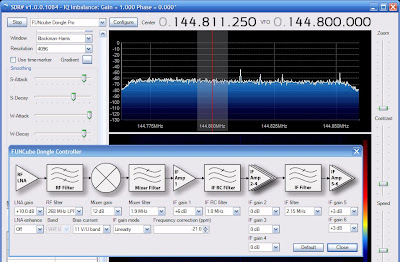 Simon Brown's SDR-Radio worked as well, and with equal ease, though as luck would have it I tried it on the very day that the (free) licence key for the program expired. This appeared to come as much of a surprise to Simon as everyone else. As I type, Simon has just uploaded a fix which I have yet to install. I thought I would try using the FCD as an ADS-B receiver which I did with the TV dongles but I soon discovered that I can't. The FCD looks like a budget USB sound card to the SDR software, so its bandwidth is restricted to 2 x 48kHz. The digital TV dongles can transfer a much wider bandwidth. This is noticeable if you try to receive Band 2 FM radio - through the FCD the signal sounds distorted on peaks because the bandwidth isn't quite wide enough for FM stereo which needs a full 100kHz.. It will be interesting to use the dongle with the FUNcube 1 satellite when it gets off the ground later this year (we hope!) In the meantime I'll use it to watch for Sporadic-E in the VHF band. My operation to remove my gall bladder was successful. Now I'm supposed to take it easy and avoid strenuous activity for a few months. No more five mile walks for a bit. It looks as if I will be logging more time in front of the computer and radio for a while. The operation to migrate this blog to a new generation Blogger template has also been completed. Comments are now working again, but I'm not happy with the header graphic. I had to go with what I could make given my absence of artistic skills, rather than what I would like to have done. So there may well be some more changes in that area to come. I had hoped to use a smart looking template from a free templates site. But at first I couldn't find how to load it into Blogger. So I started off with one of the standard Blogger templates.  As I was customising that I accidentally stumbled across the option to load a template from an XML file. Working in Blogger is like being in a maze, remembering seeing the tool I wanted but going round in circles until I located it again. The problem with the custom template was that I found it contained some things I didn't want, and the Blogger visual design tools didn't allow me to remove them. It would probably have been necessary to edit the XML, but that is a step beyond my expertise. So in the end I went back to the modified Blogger template. I'm happy with the layout now, and commenting works again which was the reason I was forced to change. In fact I now have Google+ commenting which if you haven't tried it is much better. But I'd still like to find something more radio-themed for the header graphic. Please bear with me while I make changes, try different graphics and so on. Normal service will be restored as soon as possible! It appears that commenting is broken for this blog. If you try to comment then the comment box pops up but if you click in the box to type your comment it just displays "Opening..."
I have mentioned the problem in the Blogger support forum but I haven't received any answers as yet. I'm hoping they will realize there is a problem and do something about it. I am wondering if this problem has occurred since I Google+ - enabled my blog. I mean, I know it has, but I'm not sure if commenting broke after I enabled it. And I don't know how to un-enable it. The only thing I can think of trying is to go to one of Blogger's standard boring templates. Because commenting still works on One Foot in the Grave, which uses one. I know when summer is here when I have to keep on tweaking the tuning of my MFJ magnetic loop antenna throughout the day. Having an antenna farm in the attic (or loft as it is more commonly called over here) protects the antennas from the depredations of the elements but it does subject them to extremes of temperature during the summer months. As the loft warms up during the morning the metal of the magnetic loop expands. Because the magnetic loop is a very sharply tuned antenna this has an effect on the SWR. I don't know what the temperature in the loft reaches on a sunny day but I wouldn't want to go up there. I'm not talking about a small change. I may tune the antenna to achieve a 1.2:1 SWR first thing in the morning and by lunchtime it can have increased to 2:1 or more. This wouldn't be so noticeable if I was moving around the bands retuning as I go. But I use the magnetic loop for my 30m APRS station which stays on 10.1473MHz all day and every day. (It does a jolly good job there, by the way.) If I don't pop into the shack now and again and give the antenna a quick tune I could be subjecting the transceiver to a higher SWR than is good for it. The magnetic loop is the only antenna I have that will cover 30m, so I don't have any alternative for my APRS system. This need for retuning affects all the bands I can use the loop on, not just 30m. I suppose my multiband dipole also expands and contracts with temperature, but because the tuning is broader the effect on the SWR is less noticeable. Outdoor antennas have their tuning affected by rain or ice, of course, so I'm not alone in having to put up with weather effects on my antennas. If you have used a Yaesu FT-817 on SSB you'll have probably been annoyed by the lack of a TUNE button to generate a steady carrier for antenna tuning. You usually have to press the MODE button a few times to select FM or PKT, use PTT to send a carrier, then change mode back to USB or LSB. It isn't one of life's greater annoyances, but it's a nuisance all the same, especially if you use an antenna like the AlexLoop which needs retuning every time you change frequency. 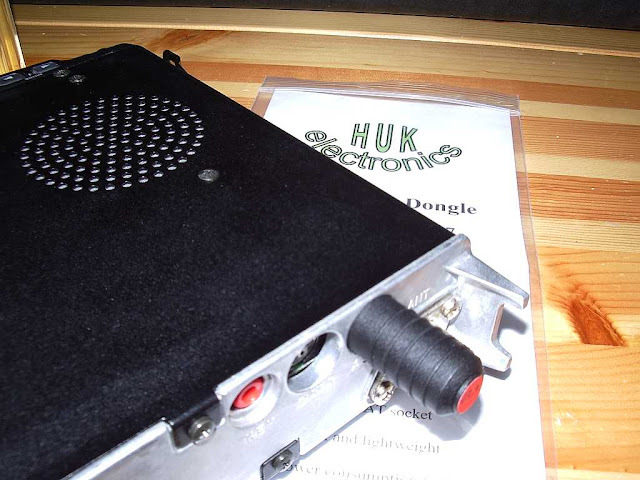 A couple of weeks ago I received a letter from one of my blog readers, John G4HUK, enclosing a Quick-Tune Dongle that he makes for the Yaesu FT-817, FT-857 and FT-897 rigs. It's a neat little gadget that plugs into the ACC port on the back of the radio. What it does is let you generate a tuning signal in SSB mode by double-clicking the microphone PTT. Simple but effective! It won't be so useful for home users who have a CAT cable plugged into their ACC port already, but for SOTA operators and other exponents of outdoor radio (apart from CW operators who can just hold the key down) it could be a godsend. The dongle didn't work for me at first until I set the baud rate of my FT-817's ACC port to 9600. This is explained in the 'manual'. The instructions also explain how you can reconfigure the dongle to change the way it works. By default it will use PKT mode to generate the tuning carrier and ignore double-clicks made in any mode other than USB and LSB, which I think will suit most people. 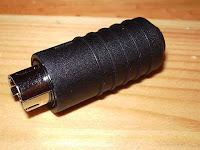 I think it is an ingenious little gadget which you can get from HUK Electronics for £15.95 + postage. Here's a video of the dongle in action. Another warm, sunny day. It really seems as if summer has arrived. But it's not the weather for sitting in the shack operating the radio. It actually gets a bit unbearable in the shack on warm days with all the equipment (not to mention the operator!) radiating heat. The weather forecast is for fime weather on the next few days. I'm not complaining but dare I say it, Olga and I have been wishing for some rain - Olga to water the garden and me to see if the rain gauge of the new weather station is really working! 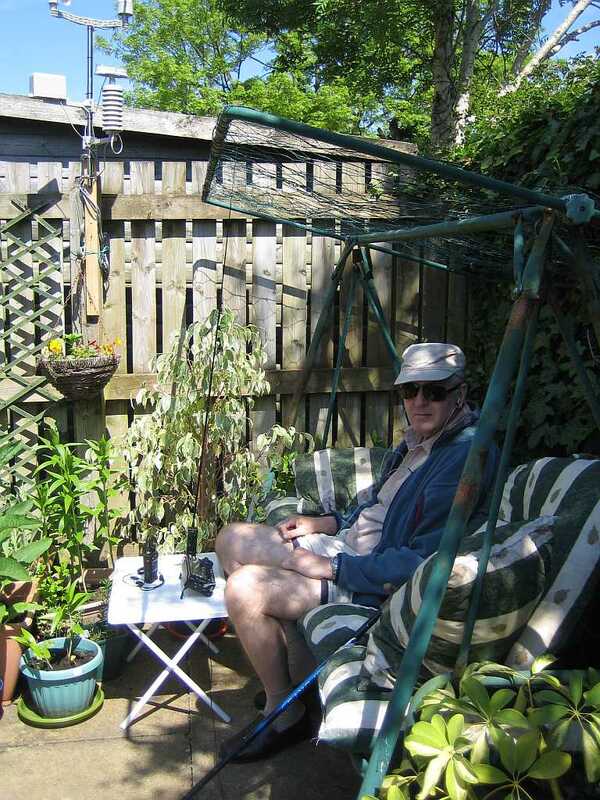 With some freshly charged batteries in the KX3 I thought I would see what I could hear from out in the garden. The answer was - not much. Band conditions seem to be pretty dire at the moment. True, the antenna I was using out there (a WonderWand L-Whip) is not the most efficient I could find but it is easy to tune and usually receives OK. But today I could hear almost nothing. I have just added a review of the Nevada WH3080 Solar weather station to my G4ILO's Shack website. The website gets a lot more visitors than the blog so I will be adding new content over the coming months.